James Basson. James joined the team at Mont Rochelle as General Manager in late 2016, overseeing the entire property and team. 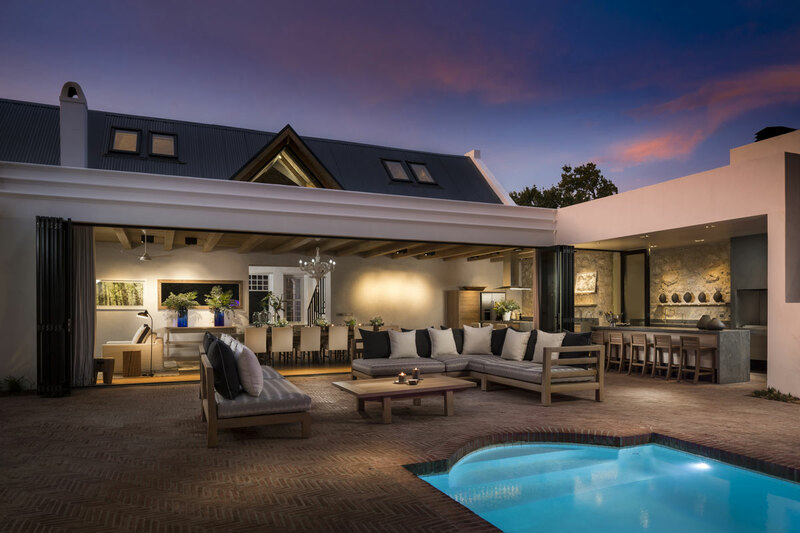 Prior to his move, James worked at BushmansKloof Wilderness Reserve and Wellness Retreat (part of the Red Carnation group) for eight and a half years, with four of those as General Manager. He has a real passion for the hotel business, team development and great guest experience, so you are likely to find him walking around the property making sure everything is perfect for our guests! Our current plans are to extend our reach to help benefit the surrounding local communities with charitable initiatives. This will evolve into opportunities for guests to visit and gain an understanding of where our staff live and what we do to assist. We are setting up a partnership with Pack for a Purpose so guests can also contribute a difference. Virgin Limited Edition purchased Mont Rochelle in May 2014 and opened on the 1st September 2014, after a complete refurbishment. Formally Mont Rochelle was owned by MikoRwayitare the founder of Telecel International, an African telecommunications company. In 2001, Miko Rwayitare purchased Mont Rochelle, known then as La Coranne making it the first black-owned wine estate in South Africa. La Coranne,was destroyed by fire in 2007, the property reopened later that year as Mont Rochelle after a rebuild. 18th June-4th July 2018: Refurbishing the main hotel bar and room bathrooms, plus the Bedrooms specifically in the Garden Wing. 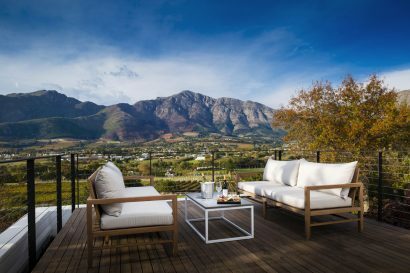 Mont Rochelle is a stunning luxury hotel and vineyard with an enviable location, set within a 100 acre wine producing estate and slightly up the hill looking into the valley, only a 15 minute walk from the centre of Franschhoek. Enjoy incredible vineyard views -itis also a wonderful spot for watching the sunset over the mountains. 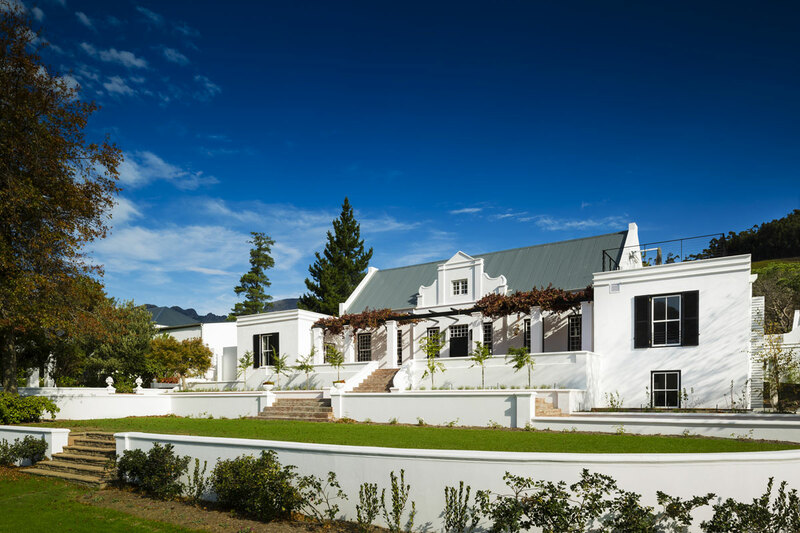 Escape to this picturesque hotel at the foot of the Klein Dassenberg mountain range for relaxation and a superb culinary experience accompanied by some outstanding wines, produced directly on the estate. Expect a warm and friendly welcome and service with delivered with personality. 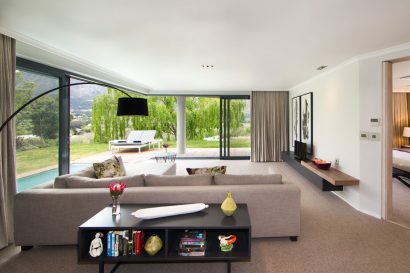 Mont Rochelle is situated in Franschhoek, South Africa. 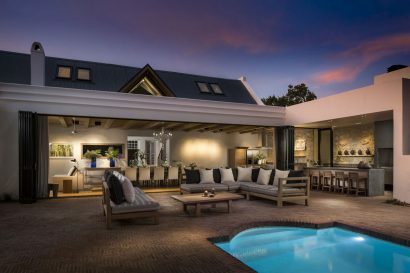 The property is just under an hour’s drive from Cape Town and is within 35 minutes’ drive of the Stellenbosch, Paarl and Somerset West wine routes. The town of Franschhoek is a traditional vineyard town in South Africa’s Western Cape Province famously known as the French Corner and is considered to be the food and wine capital of South Africa.We can arrange transfers either from the city or from Cape Town International Airport, or if you are coming by car it’s an easy drive to the property. • Wine tasting at Mont Rochelle is an everyday occurrence. We can organise wine tastings in a variety of locations, including in Miko restaurant, at our bar, at the Country Kitchen and in our wine cellar. Mont Rochelle has a resident cat called Blom. 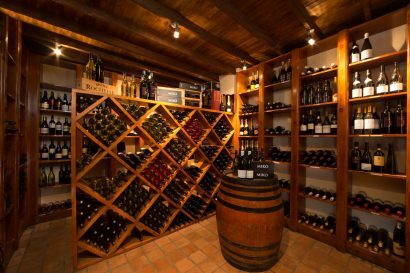 All the room categories are named after the different wine varieties in the region, Shiraz, Merlot, Cabernet, Pinotage, CapClassique which we inherited from the former owner. Our 150 year old wine cellar was previously used as a fruitpacking shed for the early settlers. Since being convertedto a traditional wine cellar we can now process close to150 tons of grapes in a season, and these smaller volumesafford more concentration on quality rather than quantity while barrels are favoured for the red wine making. Wines are available to purchase.In Mont Rochelle’s vineyard we cultivate grapes of the Sauvignon Blanc, Chardonnay, Merlot, Shiraz and Cabernet Sauvignon varieties amongst a few others. The vineyards are situated between 250m and 400m above sea level on north and north east facing slopes exposing the grapes to a range of micro climates. Mediterranean-like conditions found in the Western Cape means dry summers and high winter rainfalls of 1000 mm. Children are very welcome to stay at Mont Rochelle year-round and we have some rooms which are able to accommodate children on single beds. We have children’s games plus a TV, DVD player and games console for extra entertainment. We do not operate a set programme but would be delighted to organise activities tailored to the needs of our “Little Corkers”. Babysitting can be arranged and a charge will apply but please advise at the time of booking if this may be required. Special foodand beverages or simple snacks and light meals can be prepared according to your child’s tastes. There are also four incredibly spacious Pinotage suites, which each feature a separate lounge and fantastic views. 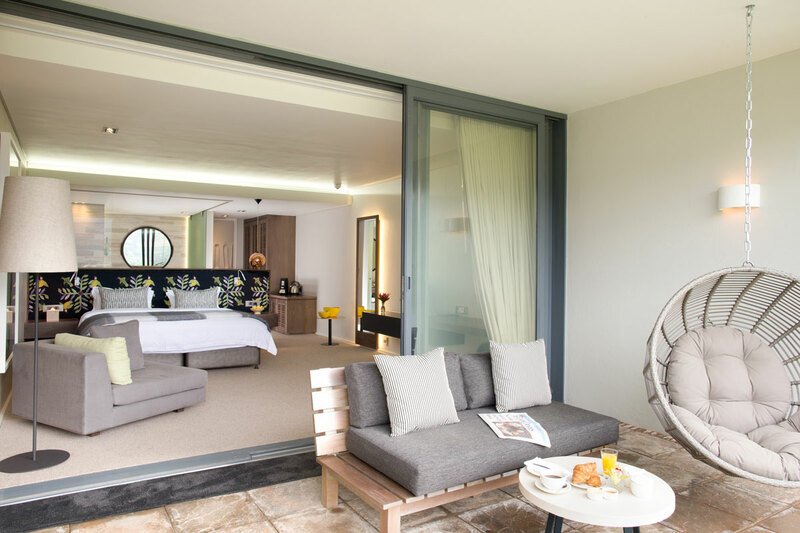 Guests staying in our two largest rooms, our Cap Classique suites, will enjoy a separate lounge area, a private terrace and their own plunge pool. All suites can be made up with twin beds on request. The Manor House is a beautiful four bedroom villa which can be booked for exclusive use and is ideal for families as children can stay in the bunk room. 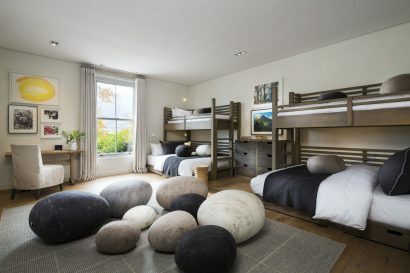 The bunk room has two double beds and two single beds that can sleep up to six children. It even has an en-suite bathroom with bath and shower. Our four Shiraz rooms with king-size beds all featuring courtyard or valley views. Our six Merlot rooms are larger than our Shiraz rooms and also boast king-size beds with valley views. 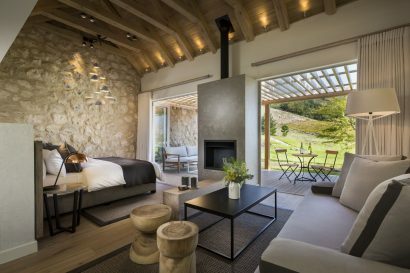 The six Cabernet rooms include a private terrace overlooking the valley.All rooms can be made up with twin beds on request. In the main hotel at Mont Rochelle there are 22 rooms and suites all arranged around the main building. We have five different types of rooms, plus a four bedroom Manor House. 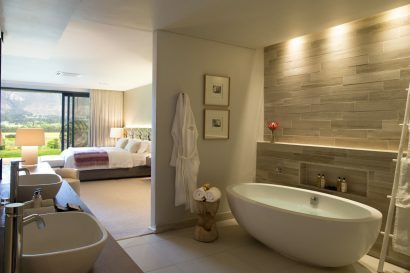 All rooms come with Africology branded bathroom amenities, tea and coffee facilities, a Nespresso machine, postcards with stamps, a safety deposit box, hairdryer, a well-stocked inclusive minibar, Bluetooth Bose speaker sound system and a flat screen TV with selection of channels. International adapters and hair straighteners are available at reception. Miko is our main restaurant and is the setting for some fantastic gourmet meals including those for special occasions. Located in the hotel, the food served at Miko is a blend of international dishes with a healthy nod to the varied nature of South African cuisine, paired with some superb local vintages. All our room rates include breakfastwhich is served in Miko. 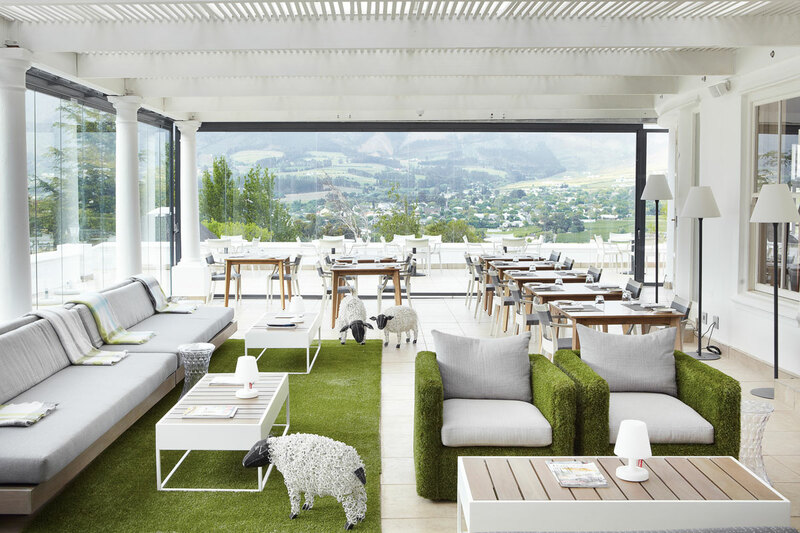 Adjacent to the winery is the Country Kitchen, an ideal spot for a light lunch. 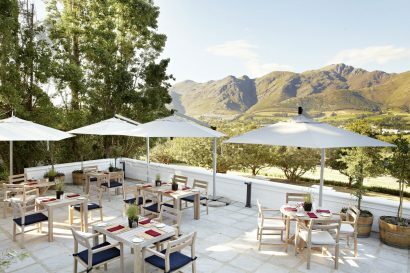 The Country Kitchen is Mont Rochelle’s informal restaurant located just a short walk or a quick drive from the main hotel building and adjacent to our wine cellar. If you’re visiting the Country Kitchen for lunch, or if you’re off to the wine cellar to taste some wines just let us know and we’ll take you over in one of our vehicles. Both Miko and the Country Kitchen are open for non-resident guests but we do recommend you call in advance to book a table. You are welcome to explore the grounds at Mont Rochelle, and what better way to do this than with a picnic basket prepared by our team? Just let us know whether you’d prefer a bottle of white, red, or perhaps both! Our bar is perfect for pre or post-meal drinks as well as light bites throughout the day. The bar is also open for an afternoon coffee or just for something refreshing on those hot days. There’s also a handy terrace so you can soak up the sun. Take a dip and relax in the main outdoor heated swimming pool at Mont Rochelle – there are some fantastic views of the Franschhoek mountains. Bar service is available around the pool and fresh pool towels are available. Mont Rochelle has two dedicated spa treatment rooms as well as a Hammam. We use the eco-friendly Africology ‘Authentic’ range of products which are made from 100% essential oils and natural plant extracts. Resident guests are welcome to make use of the Hammam at their leisure as long as it’s not in use for a scheduled treatment. Mont Rochelle also has a gym, which features key aerobic and resistance equipment together with yoga mats and free weights. 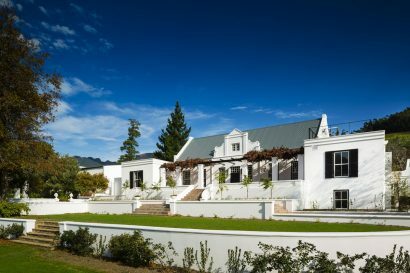 • Mont Rochelle is ideal for meetings, incentives, weddings and celebratory parties from 8 to 80 people, accommodating 52 guests overnight, plus additional children, based on Exclusive use of the hotel and Manor House. • There are various settings, ideal for celebrations, parties and weddings including our restaurants Country Kitchen and Bell which can be hired exclusively in the low season. Miko Restaurant or the Vineyard rooftop are the ideal locations when hiring Mont Rochelle exclusively. Otherwise we have the Manor House and Rose Garden or lawn, available when hiring the Manor House exclusively. • The Vineyard lounge or Manor House is perfect for a small meeting, hosting 20 guests, or for a larger meeting up to 40 guests can be accommodated in Country Kitchen. We can supply a LCD projector, screen and flipcharts and have Daily Delegate rates with and without accommodation. • Incentives group itineraries might include wine tasting and a cellar tour with our in house wine maker, picnic lunches by the dam, Wine tram around Franschhoek, mountain biking, helicopter tours, spa treatments, garden games, tennis tournaments, hiking, a cinema night, live music night or chocolate tasting. 91 (on site) plus Virgin Limited Edition Head Office and Regional office teams.